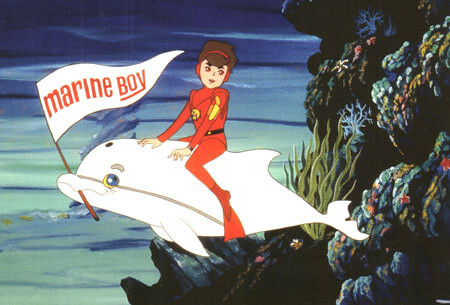 Marine Boy was one of the first color anime cartoons to be shown in a dubbed form in the U.S., and later in Australia and the United Kingdom. It was originally produced in Japan as Undersea Boy Marine. The plot revolved around the undersea adventures of a boy who was able to breathe underwater by chewing a special chewing gum called "oxy-gum". He was powered underwater by his propeller boots and armed with an electric boomerang. Marine Boy's father, Dr. Mariner was part of the Ocean Patrol, an organization set up to maintain peace and security in the Earth's oceans. Adventures often featured the Ocean Patrol craft P-1, a submarine crewed by Piper and Bullton (a double act, reminiscent of Laurel and Hardy) who would assist Marine Boy. Marine Boy leaves the P-1 to search for the wreckage of a ship sunk by Captain Rex Rancid's electronic missiles. This is one of the ones I don't remember ever seeing. Before I put this info on... I set up this post. When I found the Youtube intro I have to admit I was very worried as it does not look like something I would enjoy! So I went into this one with very low expectations. As it turns out my initial thoughts from the intro were correct. I couldn't find much I liked about this one at all. Trying to think back... was there anything I liked about this cartoon? Hmmmmm... well... the way they drew Marine Boy was pretty cool. But at the same time the voice he had seemed to have an aggravating result on me. I know this was a Japanese Anime title... so not the original voices. That is another thing... for some reason (yes I know I may get flamed for this... but) I never cared for Japanese Anime. So that is staying true to form. Pete, the term "anime" might technically be correct for such a title, but this isn't remotely representative of Anime as a genre or movement. On the other hand, it looks like completely dated crap! Did you pay money for this thing? They sure saw you coming! Actually I didn't! It was in that Saturday Morning Cartoons: 1960s collection with a lot of shows I do like... and the set was actually a gift! 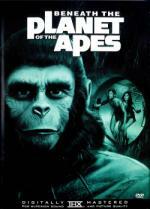 Charlton Heston and Roddy McDowall star in this legendary science fiction masterpiece. Astronaut Taylor (Heston) crash lands on a distant planet ruled by apes who use a primitive race of humans for experimentation and sport. 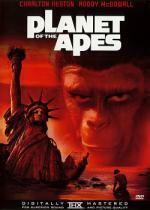 Soon Taylor finds himself among the hunted, his life in the hands of a benevolent chimpanzee scientist (McDowall). Winner of an Honorary Academy Award for Outstanding Make-up Achievement, 'Planet of the Apes' is a grand entertainment from its visually arresting beginning to the chilling last moment. 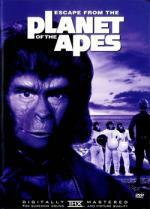 What can I say about Planet of the Apes that was never said before? Probably nothing... so I will just say I enjoyed every minute of it from the start to the surprise ending! The movie runs smoothly, it is one of those movies that the time goes by quickly without even thinking about it. I will say that there may be a little dated feel to it. But definitely not enough to take away from the enjoyment of the movie. I enjoyed every minute of it from the start to the surprise ending! I like it also since the first time I watched it when I was a kid (I've watch it so many times). I like all the four movies, even the second one who is mostly the same movie with a new guy. I love Planet of the Apes, its one of those movies I watched and the first time engrossed, I couldn't take my eyes off of it. I updated the first post with the movies I ordered the last few days... I was able to add 23 movie possibilities for this marathon... giving me a total of 57 movies from the '60s! 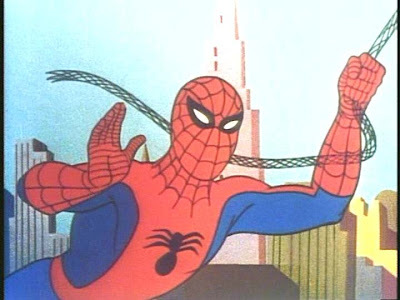 Spider-Man is an animated television series that ran from September 9, 1967 to June 14, 1970. It was jointly produced in Canada (for voice talent) and the United States (for animation) and was the first animated adaptation of the Spider-Man comic book series, created by writer Stan Lee and artist Steve Ditko. It first aired on the ABC television network in the United States but went into syndication at the start of the third season. Grantray-Lawrence Animation produced the first season. Seasons 2 and 3 were crafted by producer Ralph Bakshi in New York City. The series revolves around the scientific-minded teenager Peter Parker who, after being bitten by a radioactive spider, develops amazing strength and spider-like powers. He decides to become a crime-fighting, costumed superhero; all the while dealing with his personal problems and the insecurities resulting from being a teenager. Spider-Man risks his life to fight super-powered criminals such as Mysterio and the Green Goblin; however, New York Daily Bugle editor J. Jonah Jameson views him as a criminal, and he is continually writing front page headlines declaring him as such. Peter Parker has been sent on assignment by J. Jonah Jameson to investigate mysterious lights seen by citizens in the vicinity when his car crashes. Following a quick change into Spider-Man to rescue his vehicle, the mysterious lights cause him to stumble upon Dr. Octopus's secret lair only to soon thereafter find himself captured by one of its booby traps. Dr. Octopus plans to use his new weapon, a device which generates electronic impulses which will disrupt all the gas, water and power lines within a section of the city, to show off his tremendous intellect and power. Can Spider-Man possibly escape in time to save the city from Dr. Octopus? While I wasn't even born yet when this series started I do remember watching the reruns of this show throughout my young childhood. It was always one of my all-time favorite cartoons. And Spider-Man was always my favorite superhero. Which does seem weird considering I have always had a bad case of arachnophobia! As soon as this set became available on DVD I was sure to order it. Now I am glad I did since it is now OOP. I always thought that they should have started this series with the origin story. But for some reason they didn't. But that is a minor thing. I believe most people even then knew the origin story. At least they used one of his famous villains for the first episode. Three macabre tales of terror are featured in this frightful thriller hosted by the incomparable "Mr. D" (Lon Chaney Jr.). A psychotic photographer is faced with a beauty that haunts his pictures and dreams in one tale. A scientist becomes obsessed with a frozen "Ice Princess" that leads to an unfortunate ending in another tale. Finally, a man fears his own death after a visit with a fortuneteller in the last of these horrifying stories. This is another anthology that came in that 100 movie boxset I recently got. This one I enjoyed quite a bit. 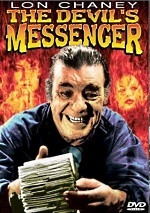 Of course Lon Chaney, Jr. plays the devil. Sitting in hell checking everyone in... when Satanya (played by Karen Kadler) who is there because she committed suicide. He gives her the chance to earn her way out of hell by making her the Devil's Messenger. Her job is to deliver items to people that are about to do something to earn their way to hell. Which is the wraparound story for the three stories (deliveries that she has to make) in this movie. while I enjoyed each of the movies.... the first one was best by far. The image on this release is decent with some flaws. The audio is pretty good... except for the scenes in hell... which seemed to be recorded in a cave as there is a problem with echoing making it harder to understand what is being said. But over all I am definitely glad I got this one in the set.